MOVA self rotating solar powered globes are offered with elegant Bases (as seen below), including Crystal Bases suitable for engraving. MOVA spinning globes use solar power, thus requiring no batteries / no wires. World globes contain solar cells that create energy to power the motor in a quiet and visually pleasing motion. Globes rotate on any stand or surface* (except for those made of iron or metal alloy that can be magnetized). Motor requires small amounts of interior or sun light to continue operating smoothly in a soothing, meditative motion. Realistically recreate earth's revolution in space. 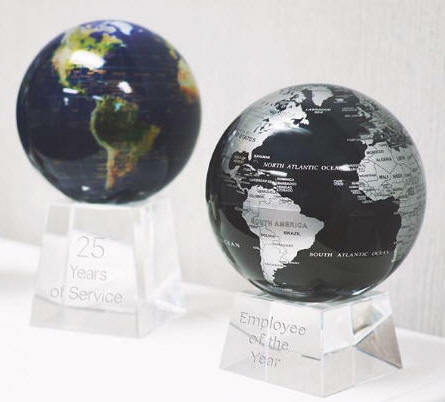 MOVA spinning globes include elegant acrylic stands and are offered with an informative user manual. Globes operate virtually anywhere indoors with an average room light or indirect sun light and requires no maintenance. This great conversation starter makes a fine gift for home or office. MOVA world globes rotate peacefully and silently using only the energy of room light and the force of the earth’s magnetic field. This is possible because the MOVA globe is actually an inner globe that rotates and is contained within an outer shell made of very clear acrylic that does not rotate. The thin space between the inner globe and outer shell is filled with a safe, perfectly clear fluid that buoyantly supports the inner globe completely out of contact with the outer shell. This inner globe, floating and turning in a virtually friction-free environment and energized by light, is analogous to the earth itself. All of these elements of the MOVA spinning globe cooperate to create a beautiful, magical object that provides a meditative point of focus to any room.